The playground is available for both short and long term hire for schools and is suitable for children from Junior Infants up to 4th class. The blocks can be used in a school hall, classroom or grassy outdoor area. For creches, we recommend our smaller set of blocks which are suitable for children aged 3 upwards. We find that children benefit most from the playground when they have the opportunity to play with it for several sessions, and so we would recommend hiring it for at least 3 days, and up to 1 month. The playground can be incorporated into numerous strands of the primary school syllabus, including P.E, Science & Engineering, Maths, Drama as well as working as a great lunch time activity and so, the opportunities are endless for teachers to add diversity to their students' learning. Is your school based in County Galway? Check out our Special Offer for County Galway Schools now. With just 10 places available, early booking is advisable. 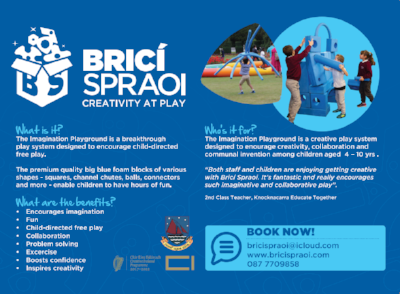 Family Play events for Dublin City Council, Áras an Uachtarán, Riverbank Arts Centre, Baboró International Children's Arts Festival, Sunrise Children's Festival, Roola Boola Children's Festival and various family events nationwide. For large events we recommend booking both our small and large playgrounds to accommodate the large number of children. Sessions can be facilitated by one of our trained playmakers.